Myanmar's new president-elect told lawmakers Monday that plans to create a new ethnic affairs ministry were "vital" as he put efforts to heal relations with minorities at the heart of policy in a nation torn by civil wars and sectarian conflict. 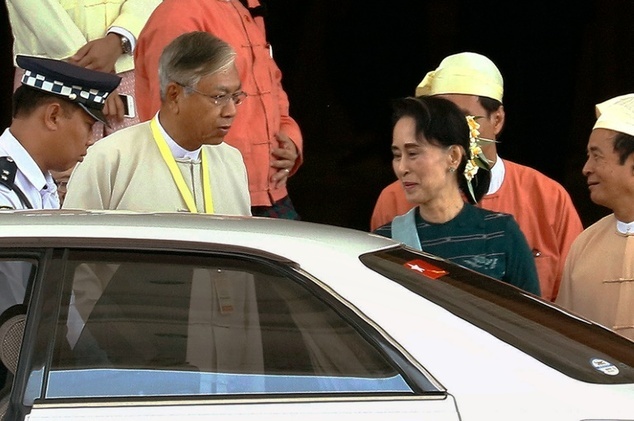 Htin Kyaw, a close confidante of Aung San Suu Kyi who will rule as her proxy, indicated that tackling the legacy of half a century of civil wars in ethnic minority borderlands will be a major priority for his government, which officially takes power next week. "A ministry of ethnic affairs is of vital importance for the future of the union (Myanmar), which needs peace, development and sustainability," he told lawmakers in his first address since being elected the first civilian leader in decades. His comments came as part of a wider speech explaining his government's plan to streamline the country's bloated bureaucracy, trimming the number of ministries from 36 to 21. Htin Kyaw takes the mantle of leadership as Myanmar is in the midst of a dramatic transformation after years shackled by military rule. Greater openness, a surging economy and the landslide victory in November's historic elections for Suu Kyi and her party have all buoyed optimism in the future. But conflicts continue to rage in several areas between ethnic minority armed groups and the still-powerful national army, which operates beyond the reaches of civilian government, after a ceasefire pact signed last year failed to include all of the country's fighters. Some 240,000 people are displaced due to unrest and communal conflict in Myanmar, mostly in northern Kachin state where fighting between the army and rebels is ongoing, and in western Rakhine, where tens of thousands of Rohingya Muslims remain trapped in camps following outbreaks of communal violence in 2012. The situation in Rakhine state is a key concern of the international community, which has urged the new government to prioritise the plight of the Rohingya, who flee the country in their thousands every year on rickety boats. A web of citizenship rules have left many effectively stateless, while they also claim to endure worsening persecution by Rakhine's Buddhist community who largely sees them as illegal immigrants from neighbouring Bangladesh. Last year saw a regional crisis emerge after a Thai crackdown on people smuggling led gang bosses to abandon many Rohingya on land and at sea. In a sign of the challenges that await the incoming government, an MP from the main Rakhine party told AFP that he opposes the idea that the new ethnic affairs ministry could tackle his state's deep communal fractures. "The ministry of ethnics affairs is concerned with Myanmar ethnics. Bengali people are not one of our ethnic groups," said Ba Shein, an MP from coastal Kyaukphyu constituency. Speaking to reporters in Bangkok on Monday, Volker Turk, the Assistant High Commissioner for Protection at the United Nation's refugee agency said the international community understood that Rakhine's situation was "complicated". But he expressed hopes that the new government will "find ways and means to address it, in dealing with all the populations that are there". Suu Kyi has remained reticent on the issue while the National League for Democracy did not field a single Muslim candidate in elections, a move observers say was designed to placate Buddhist nationalists. She is barred by the junta-era constitution from becoming president, although she has vowed to rule through the next leader. Her role in Myanmar's government has yet to be revealed, amid speculation that she could either take the role of foreign minister, or chose to keep her power-base as NLD leader and take approach akin to that of India's Sonia Gandhi. The cabinet is expected to be named on Tuesday.